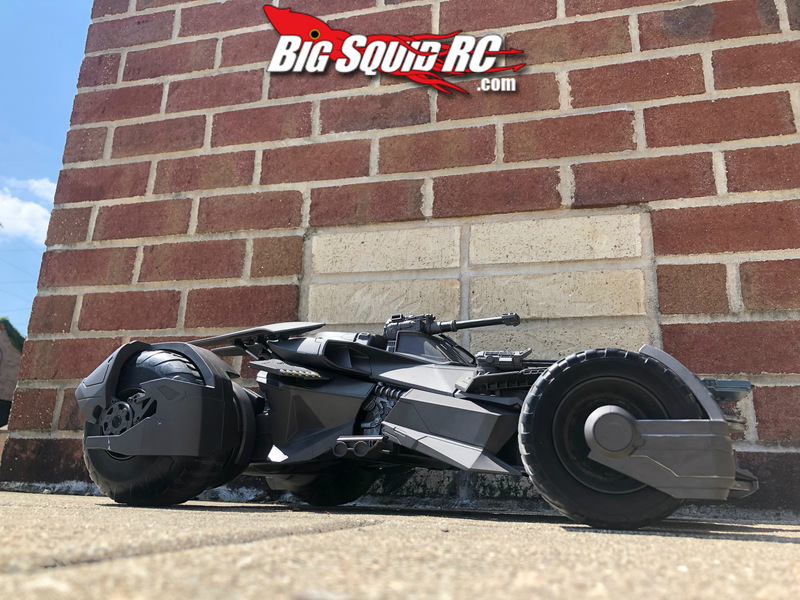 Everybody’s Scalin’ Batmobile « Big Squid RC – RC Car and Truck News, Reviews, Videos, and More! Have you ever danced with the devil in the pale moonlight? The Batmobile is the most iconic superhero vehicle on the planet. The 1966 Batmobile really started it all. Fast forward to 1989, which in my opinion, is the best looking Batmobile ever made, the Michael Keaton Batmobile. Next, in 1995 we had the Val Kilmer Batman Forever Batmobile. 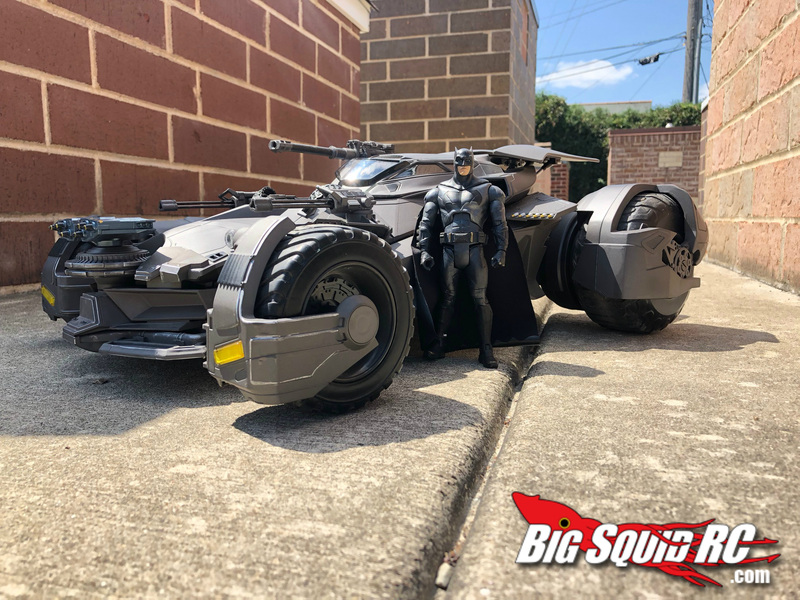 The Batman Forever Batmobile took on more of a comic book design that has left a lasting impression. Then, we come to the 1997 Batman and Robin Batmobile. This was the first Batmobile completely designed by the toy company Kenner. They wanted kids to be able to play with an exact replica of a car from the movie. In 2005, the Tumblr was revealed in Batman Begins. Personally, not a big fan of the Tumblr, it took on more of a military tank look than a superhero vehicle in my opinion. In 2016 and 2017 the Batmobile took yet another form in Batman versus Superman and Justice League. Almost every Christmas, when I was little kid, my grandpa would get me a remote control Batmobile. They were cool and everything but they were cord chasers. You know, the cords attached to the car and the remote so you had to follow it like you were walking your dog. So last year when I started seeing some videos float around on social media about a new Mattel Justice League ultimate RC Batmobile my inner child started screaming with anticipation. In the world of hobby grade RC when you hear Mattel you don’t really expect a good RC car. 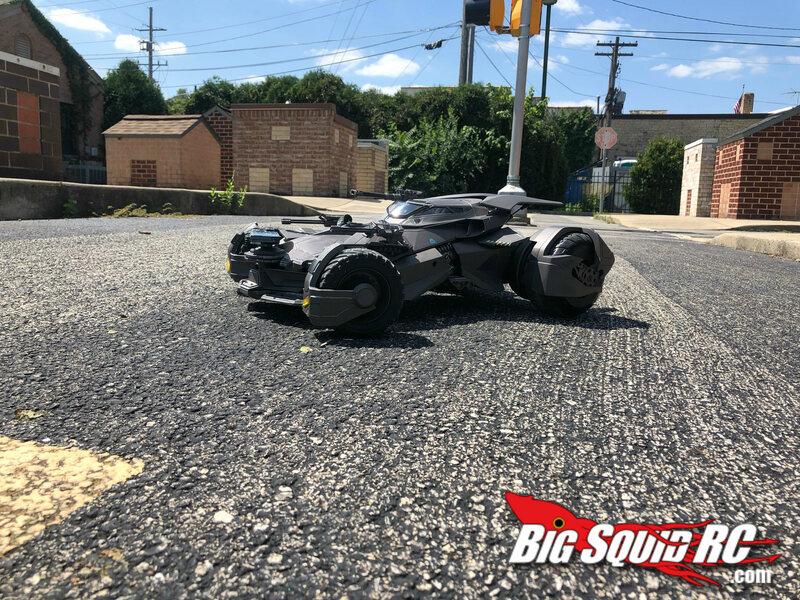 The Mattel Justice League Ultimate Batmobile is not going to be break any land speed records and definitely don’t be launching it off any ramps. I consider it a borderline toy grade/hobby grade RC car. 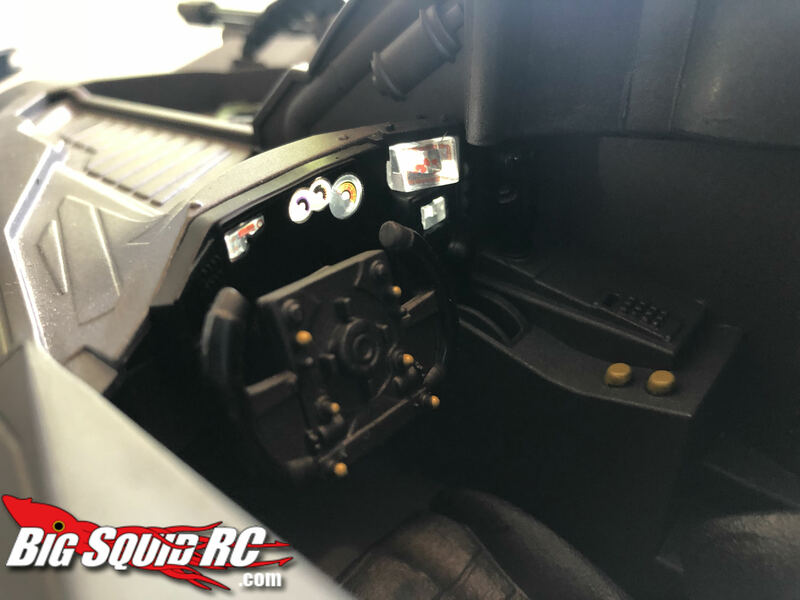 What makes me consider it part hobby grade is the fact that throttle and steering controls are responsive to what you’re actually doing; not just the all or nothing like 99% of toy grade RC cars. Where it falls into the toy grade category would have to be the hard tires, slower speeds and parts availability. 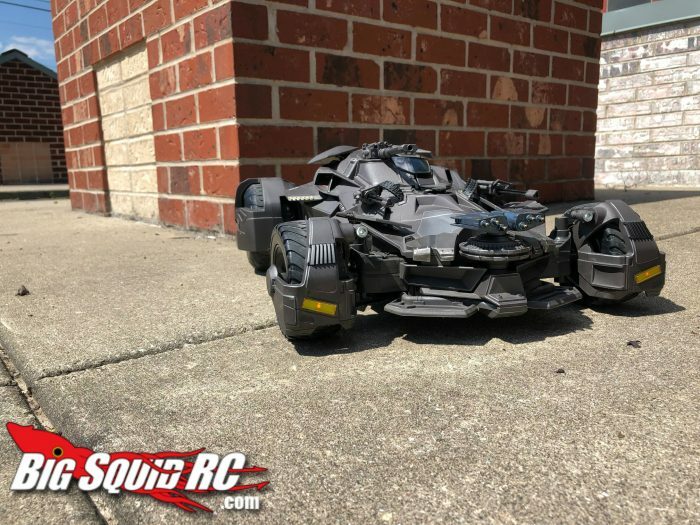 If you break any sort of part on the Justice League Ultimate Batmobile you’re not going to be able to go to the hobby shop and replace them. 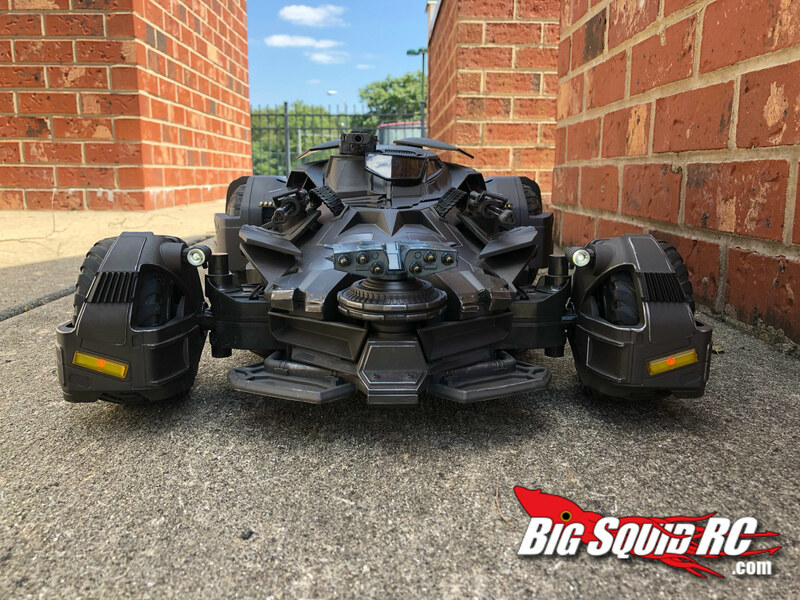 With that being said, the Justice League Ultimate Batmobile has some amazing features. There’s a sound module that’s proportionate to the throttle, smoke that comes out of the exhaust and flows out faster when you’re giving it some throttle. FPV camera mounted on the driver seat, Interior lights as well as exterior, that you can turn on and off. 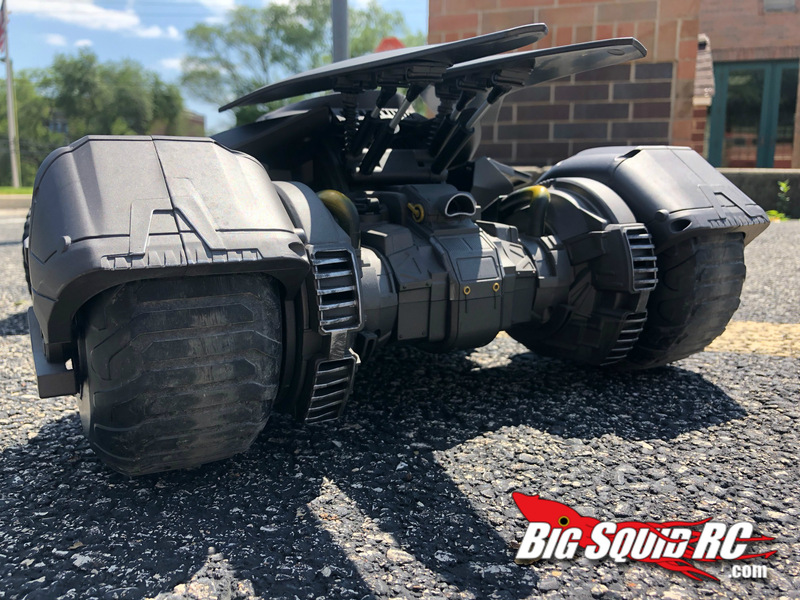 The whole vehicle is controlled from an app on your phone that connects to the Justice League Ultimate Batmobile’s Wi-Fi hotspot. I wasn’t a big fan of having to use my phone as a remote control but this is where the FPV camera comes into play. 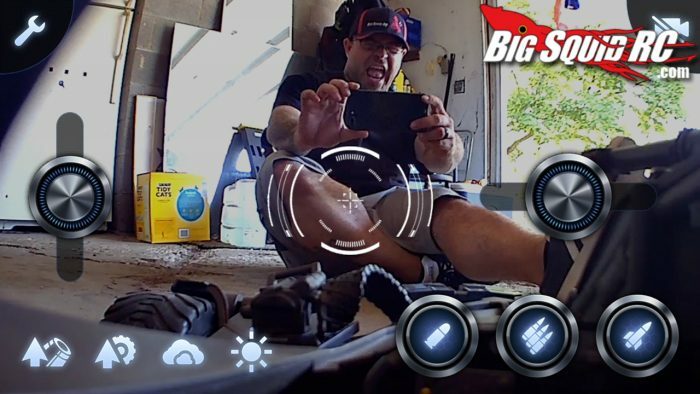 When you’re in FPV camera mode there’s an augmented reality feature. Whenever you fire the guns or cannons you actually see the Rockets and bullets fire and then explosions through the screen on your phone. The battery for the Batmobile is a cheap little 9.9v 1100 mAh but for this vehicle that’s all you really need. It comes with a charger that takes about 35 minutes to charge the battery; there’s really not much of a wait time like other toy grade batteries. The battery tray is big enough where you can fit a small 2S Lipo but I wouldn’t recommend doing that unless you’re going full hobby grade with the electronics. Plain and simple, no one wants to see the Batmobile on fire. So, if you have been on the fence about picking one up, do it. It’s a lot of fun and the price has dropped considerably from when I first bought it. I pre-ordered mine at $250 but I’m seeing them for sale anywhere from $100 to $140. Then, everyone will ask, “Where does he get those wonderful toys?”.